2009 Hanoverian colt by Black Tie out of Azalia, dam to 3 premium GOV foals in a row, including a TOP COLT and STALLION PROSPECT in 2007. 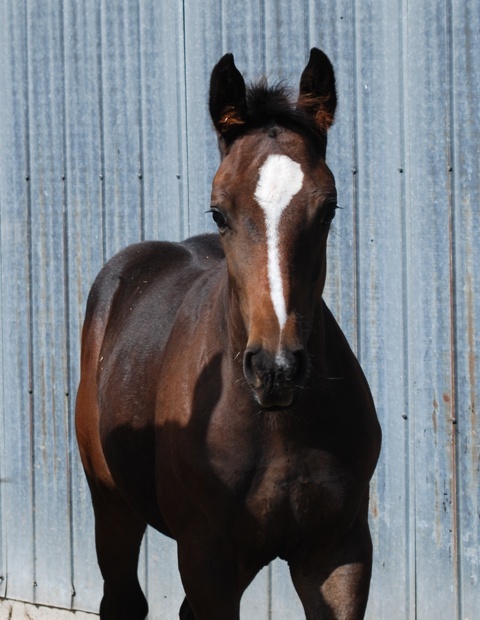 Her 2008 filly was deemed of premium quality as well but opted to buck and play instead of displaying her good gaits. This foal should be at least as nice as his half-siblings out of this up and coming Hunter stallion. Dressage-bred, Black Tie is now shown as a Hunter with great success. Dam is a highly successful career broodmare and produces foals of not only high quality but also very amateur-friendly. Berlin is very strong, balanced and uphill. He enjoys canter serpentines complete with lead changes in the pasture. He is most certainly a serious hunter candidate when he settles down after a few crazy laps of pure foal fun. His natural balance and sweeping canter strides will make it all look easy. Berlin is very friendly and well-behaved. Will lead, clip, bath and load reliably before leaving the farm! Price includes board until weaning as well as registration and inspection fees. Terms: Terms to be discussed on a case by case basis. Contact Mathilde at info@equusmagnificus.ca for more information.